Washington — The US on Monday will issue temporary sanctions waivers allowing eight countries to keep importing Iranian oil, but two countries have agreed to end those deals within months while the other six have agreed to "greatly reduced levels," Secretary of State Mike Pompeo said Friday. The EU will not receive one of the waivers, Pompeo said during a call with reporters. He declined to name the eight countries receiving relief when US sanctions go back into force Monday. Pompeo said US actions have already cut Iran's oil exports by more than 1 million b/d before the sanctions take effect. "Our laser-focused approach has succeeded in keeping prices stable with the benchmark Brent price right about where it was in May 2018," when President Donald Trump announced the US would leave the Iran nuclear deal, Pompeo said. ICE January Brent closed at $72.89/b Thursday, down $2.15/b from Wednesday, and NYMEX December WTI was down $1.62/b at $63.69/b. Pompeo compared the implementation to the 20 countries that received waivers during the Obama administration when sanctions were in place from 2012 to 2015. "Not only did we decide to grant many fewer exemptions but we demanded much more serious concessions from these jurisdictions before agreeing to allow them to temporarily continue to import Iranian crude oil," he said. "These concessions are critical to ensure that we increase our maximum pressure campaign and accelerate toward zero [imports]." A State Department spokesman declined to comment further, stating that Pompeo's comments during the call encapsulate "all of the information that is currently available on sanctions and waivers." Treasury Secretary Steve Mnuchin said during the same call that the US intends to "aggressively enforce our sanctions on Iran." 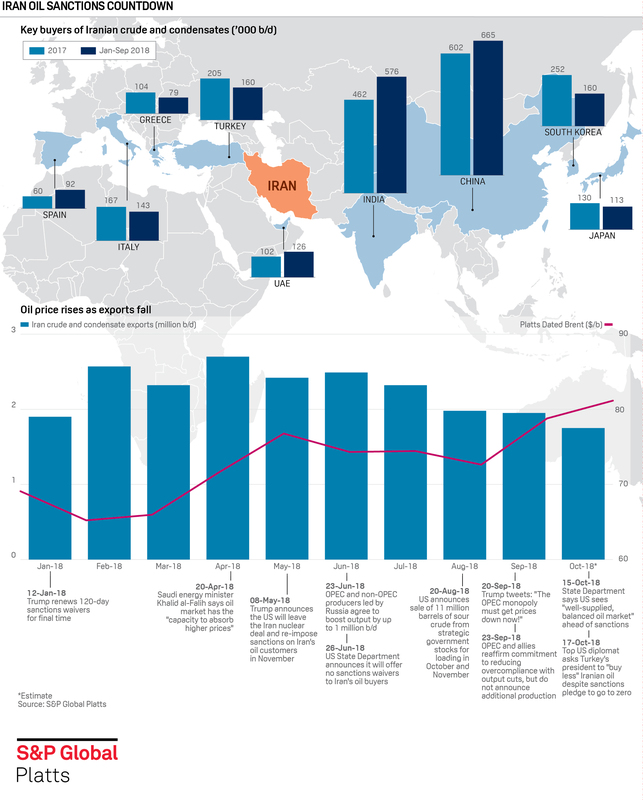 The sanctions are expected to cut Iran's exports to 1.1 million b/d in November and to 850,000 b/d by the fourth quarter of 2019, compared with a six-month average of 2.4 million b/d earlier this year, according to S&P Global Platts Analytics. Platts Analytics estimates China and India will both keep importing at least 300,000 b/d of Iranian crude in November, compared with their April/May volumes of 690,000 b/d for India and 684,000 b/d for China. The sanctions ultimately will keep Iran's crude and condensates exports within a range of 800,000 b/d to 1.1 million b/d, with shipments continuing to China, India and Turkey, predicted Amos Hochstein, senior vice president of Tellurian and former special envoy for international energy affairs in the Obama administration.